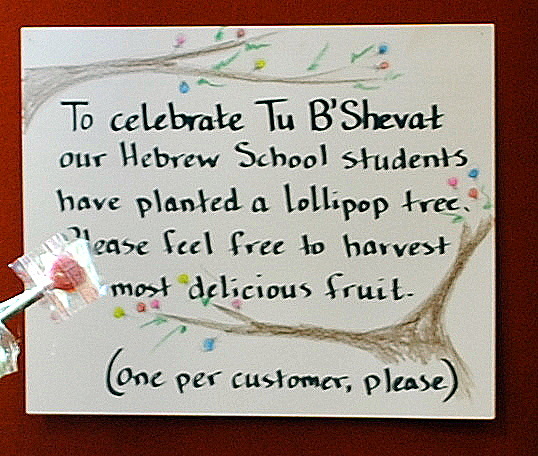 Tu B’Shevat was last week and we celebrated with our Hebrew School. 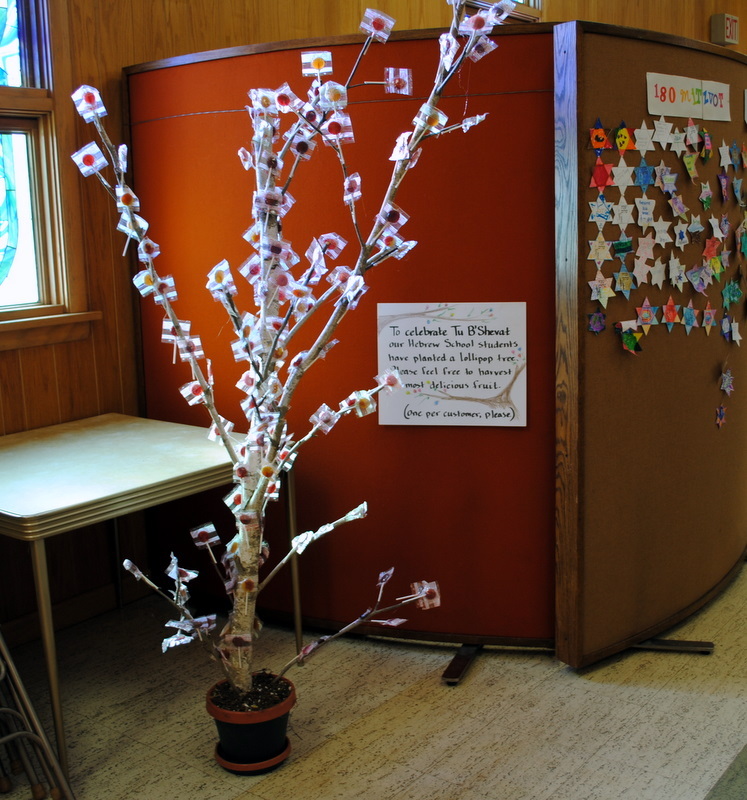 And, as a fun addition to our Hebrew school traditions, we planted a lollipop tree! Two weeks ago we planted the “seed” (cut the top off the lollipop and put it in a pot of dirt). We watered it with sparkles. That way everyone could water as much as they liked without the soil turning into mud soup. Only our youngest class even remotely thought we’d grow a real tree, and even they looked very suspicious. When our students showed up on Sunday, they found their tree. They had been very close to the truth. I had set a branch in an apple juice container ( a milk carton would work too) and poured concrete in to anchor it down and make the “tree” more stable. Then I re-planted it in the pot, covering the base with dirt to hide it. Then, with the help of my kids, I glued lollipops all over it. We use Yummy Earth Lollipops, which in my opinion are the best around, they are all natural with no dyes, preservatives or high fructose corn syrup. And best of all they are Kosher too! Everyone enjoyed lollipops. Even my 7 month old baby managed to crawl all the way over to the tree. (He only just figured out crawling the day before.) The promise of sticky sweet lollipop is a great motivator. For more fun activities and ideas for Tu B’Shevat, visit Baum’s blog.